*Disclaimer: Dog pictured is not up for adoption. Always research any new plants to ensure they’re not toxic to your pets, and double check those already growing in your yard. Hundreds of plants can be toxic to pets, including azaleas, daffodils, tulips, and amaryllis. Avoid using cocoa bean mulch, as it contains toxic chemicals similar to chocolate, making it dangerous if ingested by dogs. Pine, cedar, and hemlock are safer options. Be especially diligent in researching your insecticides, pesticides, and fertilizers before buying. Some are less dangerous to pets than others and you should always follow the written safety instructions, keeping pets off the treated area for the prescribed amount of time. 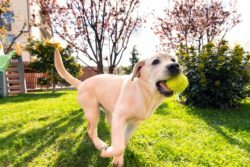 If your pet ingests any dangerous items or starts to act differently after spending time outside, be sure to get in contact with your vet right away. 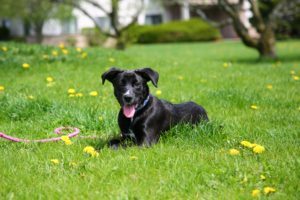 For more pet safety tips, please visit www.wihumane.org! *As you may have heard, Door County Humane Society is currently housing nearly 30 dogs from other shelters to assist them as they work through an animal health situation. (More on that here: https://www.wihumane.org/news/wisconsin-humane-society-lending-shelter-for-brucellosis-response) To ensure they’re able to properly care for the new arrivals, they are temporarily closed for adoptions while they get them settled in, and will resume regular adoption processes in the near future.